Fran assumed the principal ownership of the company in 2009 and will be managing the day to day operations of McGinnis Auction & Appraisal Service. Having over 40 years experience in the real estate industry, formerly a co-owner and manager of top producing real estate franchises such as RE/MAX. Fran has proven to be a wonderful and valuable asset to our daily auction operations, it was a natural choice to turn the operations over to her. She is a Licensed Real Estate Broker in Kentucky and Indiana, and she also owns and manages Real Estate Unlimited with 85 agents, serving clients in both Kentucky and Indiana. Fran's auction experiences and real estate knowledge are of great value when dealing with the public, both buyers and sellers. Her understanding of the auction processes and when to use auction as an option for selling real estate has been extremely beneficial to many of her real estate clients. Fran has been a driving force in many of our successes. She possesses the people skills necessary to respond to the many special needs which arises on auction day. She is actively involved and will be the main focal point in day to day management and administration of McGinnis Auction & Appraisal Service. 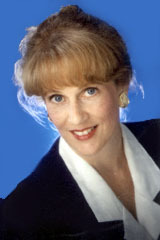 She is also a Certified Personal Property & Equipment Appraiser. She is an active member of the St. Matthew's Women's Club. Note: The best way to contact us is through our contact page.